Base on tigershark's thread pad replacement DIY, I changed my front and rear brake pads. Here is a pictorial how to. 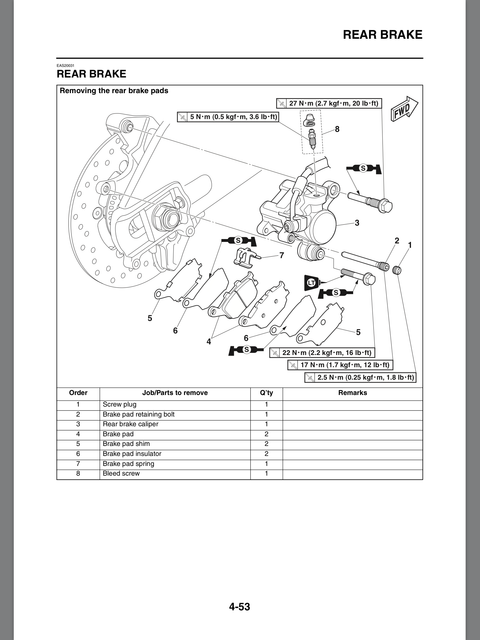 I've also included the factory manual pages for the job as well as ft/lbs conversion to in/lbs. Please read all the way through this and don't "wing it" unless you've done this before. I recommend that you use a rear wheel lift for the bike, but it would not be necessary to do this project. 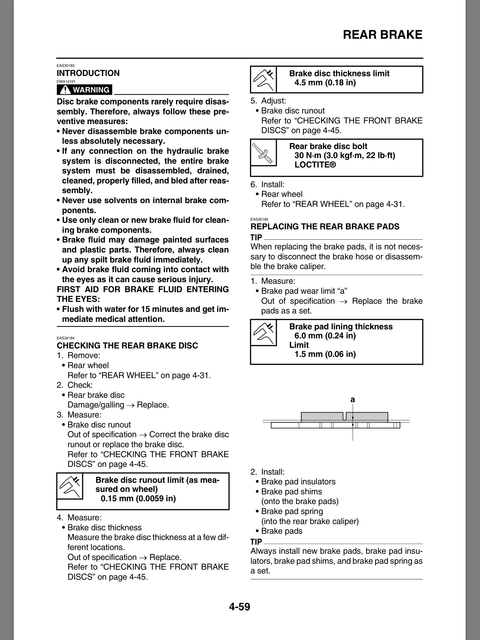 What you will need in parts: (I used EBC Double-H Sintered pad but there are other choices) Part numbers are shown. You will need 2 sets for front and 1 set for rear. These are so easy to change that anyone can do it with a set of needle nose pliers. This process is repeated for both sides. Step One: Remove the two hair pin cotter pins holding the brake pad pin with needle nose pliers. Save these and watch they are small and can get lost easily. Step Two: Slide brake pad pin out and remove brake pad spring. Step Three: Remove pads. They will just slide out. Step Five: Place pad retention spring back into caliper and make sure it goes in the same way (arrow on spring will point direction) Also you can see the manual photos below for reference. 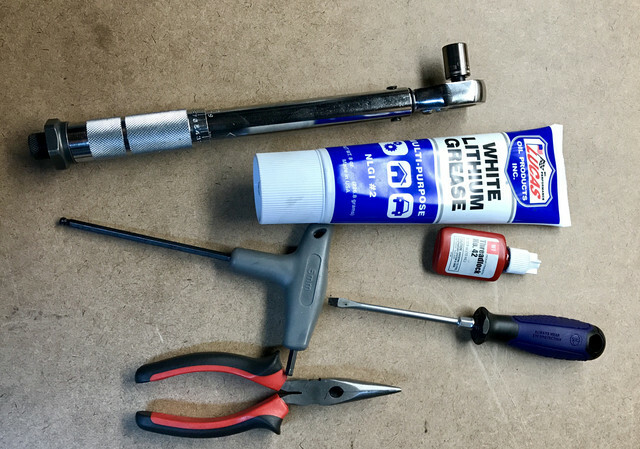 Step Six: Very lightly use the white lithium grease on the brake pad pin and re-insert through caliper, front pad, compressed spring, back pad and caliper. You can wiggle the pads around from the back if needed. Step Seven: Re-insert the two hair pin cotter pins in the brake pad pin holes. Step One: Remove the cap screw with a flat head screw driver and save. It is small so keep it in sight. Step Two: Use 5mm allen head key to remove the brake pin. As soon as you remove the pin the back pad will fall out. Step Three: Use 12mm socket to remove the lower rear screw that holds the caliper on. You do not need to take it out just free the caliper up to rotate it. Step Four: Lift caliper up slightly to remove the rear pad. 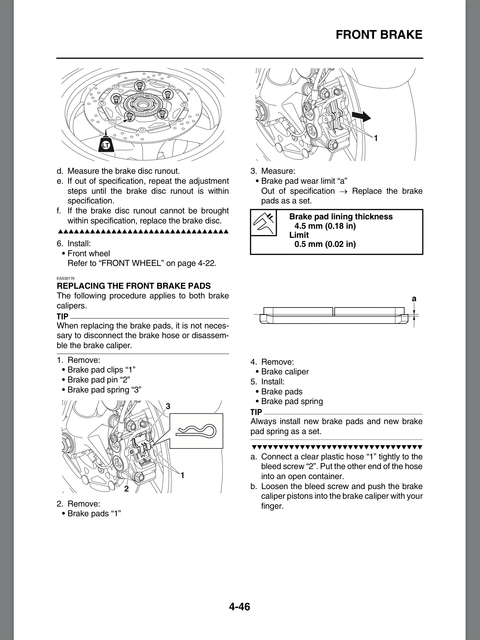 You are removing tension from the rear pad spring (see manual photo below). 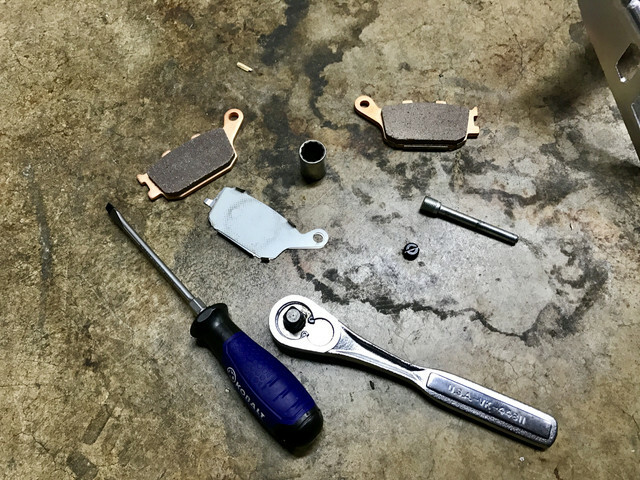 Step Five: Remove the Shim and Insulator (see manual photo below) from old pads and reinstall them on new pads in the order than they came off. 1. Get to 60 mph and then slow down quickly to 30 mph three+ times using the front brakes until you feel a "bite" and the ABS start to kick in. 2. 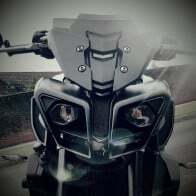 Get to 60 mph and then slow down quickly to 30 mph three+ times using the rear brakes until you feel a "bite" and ABS starts to kick in. Drive around normal until the brakes "bed-in". BUT....your brakes will not be 100% effective until they "bed-in". Great addition to what I posted. The best part was front and rear caliper body removal not required. The first thing I did was pull off the calipers, which wasn't difficult but totally unecessary. And not removing the rear caliper main front mounting bolt. That was the bolt I had a problem with crossthreading on me. Brilliant. Your procedure really simplifies the process which was already very easy. Thank you very much. Just finished the job after reading your tutorial without a single hiccup. So easy and quick. Looking forward to being able to stop! Thank you. Gonna need to do this soon. This is gonna help alot. Didn't really follow this, but otherwise thank you for posting. Valuable information for the community. 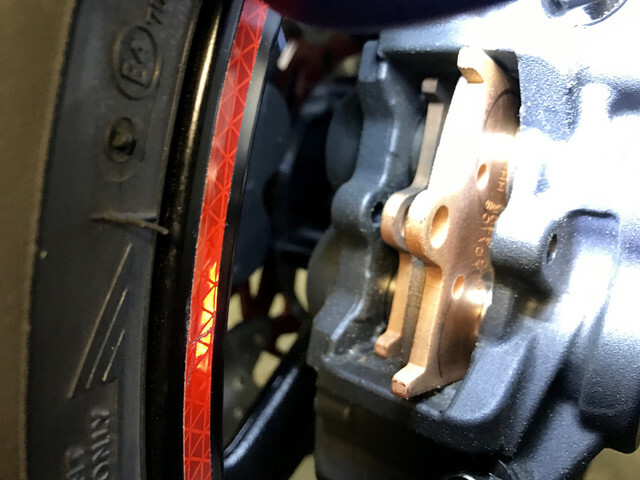 That said, I put on the Brembo SC pads from Sportbikes4hire.com (PJ and Corey) and they made a huge difference in brake feel AND stopping power. There's still a bit of squish in the lines, but I can finally get the front to lock/ kick in ABS without the lever bottoming out on my other finger's knuckles. Bedding-in was also very easy with these and the compound on the pads. Simple, inexpensive, extremely effective mod. The new pads won't be a straight swap if the old pads have worn. This is owing to the brake pistons being pushed further out as the pads wear. 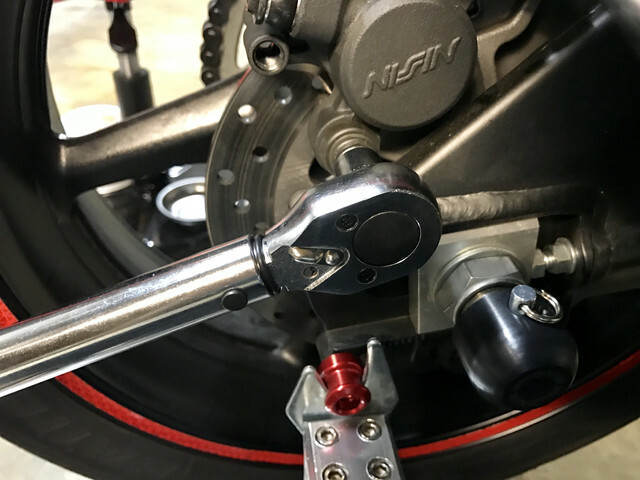 Removing the master cylinder cap and diaphragm will allow the brake pistons to be pushed back in much easier to make room for the new pads. 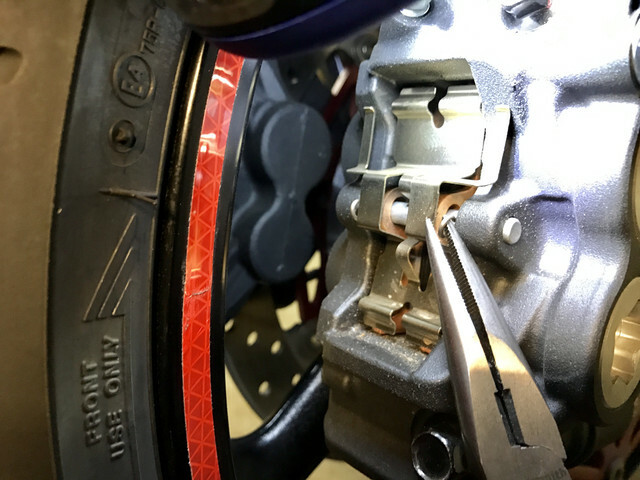 While the removal of the caliper is not necessary if your doing this I'd recommend you do remove them. Firstly give the calipers a damned good clean and more importantly the pistons. This is particularly important if your pushing the pistons back in some way. 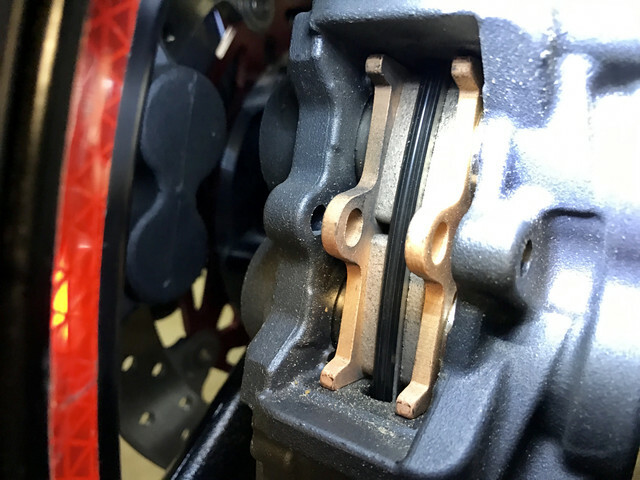 You don't want any crap getting pushed into or beyond the piston seals as this can cause swelling under the seal and the brakes to lock when hot. Depending on how may miles you've done on your old pads I'd advokate you flush through your old fluid too. 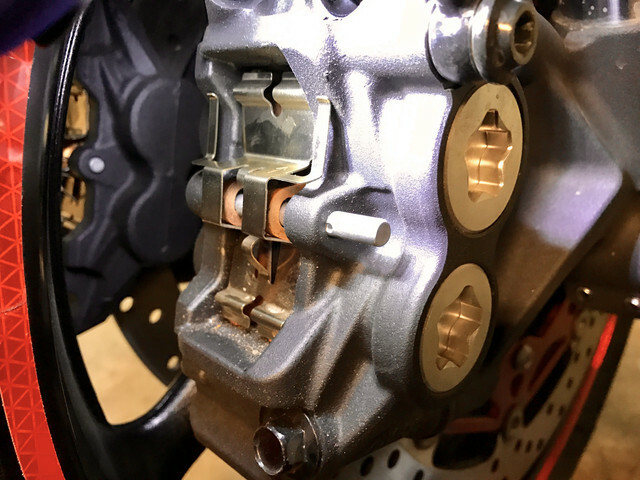 You will likely need to bleed any way so, keeping an eye on your reservoir levels, pump out all the old and keep topping up with new until it runs clean at the calipers. 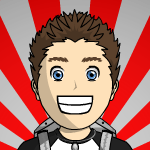 This only made a 20 min job take about an hour so doesn't add too much more time and is very little extra effort. These are the sort of threads which make these forums invaluable. Kudos for taking the time and effort to layout the method for this mod. I've worked with tools my whole life, so yeah it is good to have a bit of knowledge of how to use spanners, but it's not rocket surgery. Lost are the skills when everyone worked on their own vehicles and fixed carburettors etc, and if you couldn't get it to work first time you just went to the tool box for a bigger hammer. Thanks! 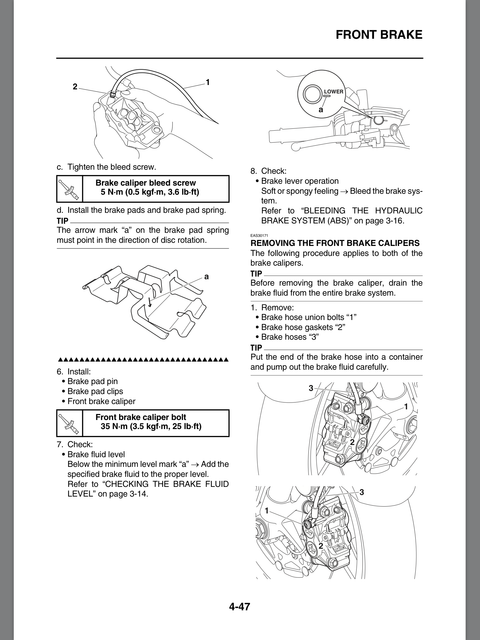 Replaced my pads today (with Brembos), your instructions helped a lot! Which ones? 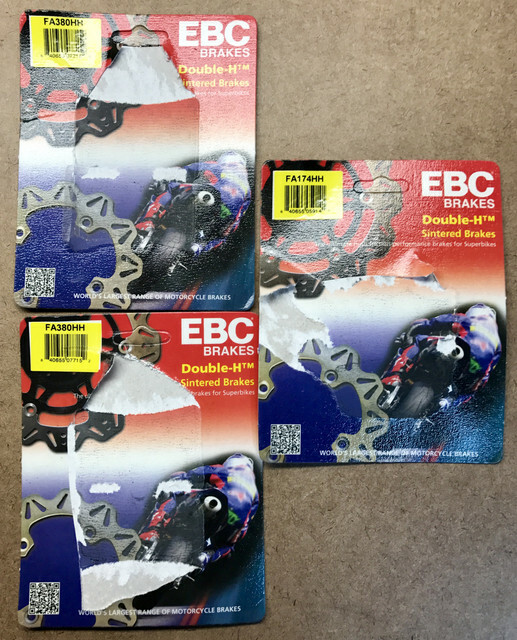 Brembo SCs too? I'm still breaking my bike in, so no hard braking yet. I won't track my bike, so was thinking about leaving it stock, but one statement above bothered me a little: That you need to almost bottom out the lever to activate ABS. I also brake with 2 fingers, so my other knuckles could be on the way too, although I have the lever on the farthest adjustment, so not sure it'd be an issue for me or not. 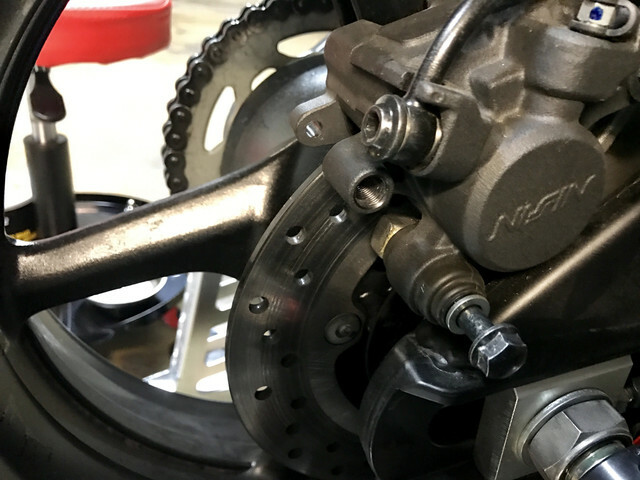 The initial bike is fine with the stock brakes. I wouldn't like anything super grabby for just street riding. Just something nice and linear that will do the job witih 2 fingers without bottoming out. Is there something like that, or better just stick with stock pads? Thanks.